The Cathedral of the Pines or Cathedral Pines as it is also known, is a little known hiking spot located less than 30 minutes from the Bed and Breakfast. The Pine stand covers over 42 acres, and while devastated by three tornadoes in July of 1989, the remaining trail still covers the intact portion of the stand, and is well worth the visit. Cathedral Pines was New England’s largest stand of old-growth white pine, hemlock trees and northern hardwoods, and while the tornadoes did substantial damage, many of the trees survive and you can still experience the size and beauty while walking under the canopy of trees. One of the reasons to take this hike is to see the after effects of Mother Nature at work, and to see the stand itself slowing recovering from the devastation. 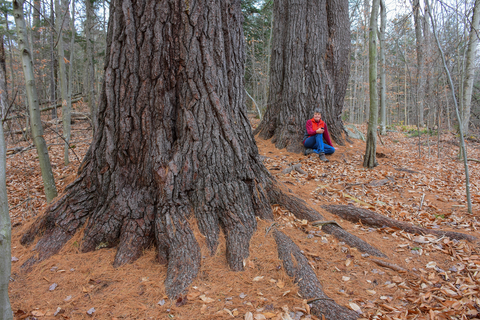 White pines are unusual to see in this part of Connecticut, and most of them are 200 years old with some being at least 300 hundred years. The Cathedral Pines forest itself was established between 1770 and 1800. It was part of a thousand-acre farm inherited by Major Seth Pierce (1785-1881), Following Pierce’s death in 1881, Frederick Kellogg sold the Pines to John Calhoun, who vowed to preserve the majestic forest. The Pines at different time periods were also called Calhoun’s Pines and the Calhoun Grove. In 1967, the children of John Calhoun deeded the 42-acre Cathedral Pines to the Nature Conservancy, which established the forest as a research area protected from human influence in its development. Rather than harvest high quality lumber from felled trees, the Nature Conservancy allows them to decay naturally. Cathedral Pines was declared a National Natural Landmark in 1982. The Nature Conservancy while studying the Pine Stand observed that the pines were being slowly replaced by hemlock trees. The slow transformation of the forest from pine to hemlock was sped up dramatically in 1989 by the devastating tornadoes. While visiting the Pine Stand listen for woodpeckers and owls at dusk, bring bug spray and good hiking shoes. While the trail is an easy one, there are quite a few downed branches and dried pine needles that make walking in sandals quite uncomfortable. A trip to the area is never complete without a visit to the Eric Sloane Museum & Kent Iron Furnace. The Museum is on the National Register of Historic Places and a Connecticut State Archaeological Preserve. The Museum is owned and operated by the State of Connecticut Department of Economic and Community Development, State Historic and Preservation Office. Eric Sloane (1905-1985) was an artist, author and illustrator of over 30 books, and a collector of American artifacts. In the museum itself, Sloane’s studio has been recreated with his painting easel and jars filled with paintbrushes, alongside examples of his works in the adjacent art gallery. Sloane built a cabin in the pioneer style modeled after Noah Blake’s “Diary of An Early American Boy”, an 1805 diary published by Sloane. 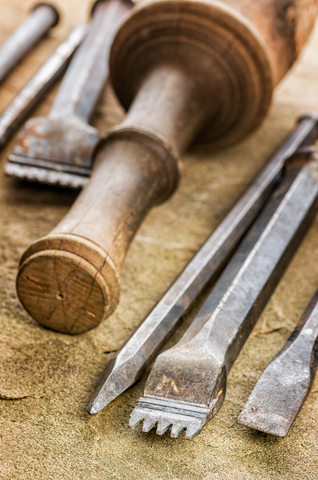 Eric Sloane’s collection of hand tools is displayed in the museum building gifted to the State in 1969 by Stanley Works, a Connecticut-based tool manufacturing company, to mark their 125th anniversary. The collection tells a fascinating story about historic times and the great American heritage of craftsmanship. The Kent Iron Furnace, also on the museum property, began production of pig iron in 1826, and continued production for almost 70 years. A display explaining the local iron industry is in the museum lobby as well. This past summer, the museum become one of a handful of museums in the country with an heirloom variety apple orchard. The orchard, envisioned through collaboration between the Friends of the Eric Sloane Museum and Peter Montgomery, a Silicon Valley executive turned horticulturalist, was installed on the grounds of the Eric Sloane Museum of Kent this past April. Discounted admission for schools and groups by appointment. Save the Date! October 8th, 2016 for an apple tasting event sponsored by the Friends of the Eric Sloane Museum with culinary teacher and chef Anne Gallagher. This free event will run from 11:00 am to 1:30 pm. Please RSVP by calling the museum at (860) 927-3849 and leaving a message with your name, contact information and number of people who will attend.